As the mornings and evenings start to draw in and get darker it’s so easy to hibernate – who wants to get out of bed when it’s dark or go to the gym after work when you’d rather huddle on your sofa? But these are the months when we most need exercise, our bodies are sluggish and so are our immune systems and dehydration levels – especially first thing in the morning. 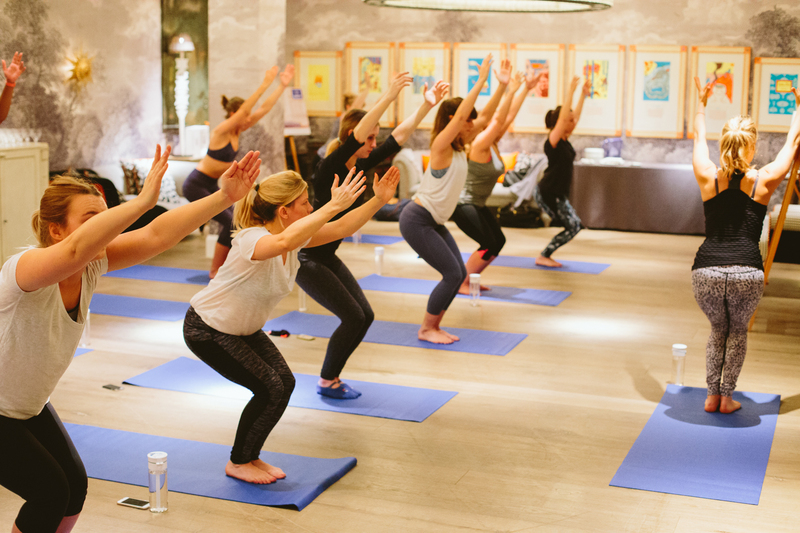 This is why nutritionist and ‘Get the Glow’ author Madeleine Shaw has teamed up with BRITA to show us some simple yoga moves to wake up the body every morning – making us ready for the day ahead of us. The workout features key poses that defend against winter bugbears like dry skin and hair or the winter bulk. The horse stance strengthens the entire hormonal system leading to more energy and healthier hair, skin and nails. 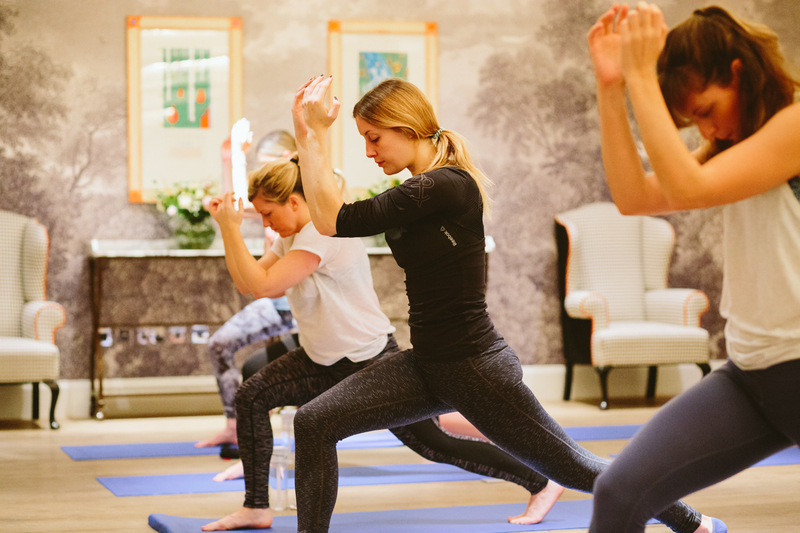 The Warrior II pose aids digestion, which stops you feeling bloated and tired. “Your mind is a muscle too so completing these moves and staying hydrated will ensure that you feel physically and mentally ready to be the best that you can be during winter. With it’s easy sip straw, I find using my BRITA Fill&Go is perfect for drinking whilst in a yoga position and it also means I can keep it on my desk for the rest of the day – a perfect reminder to keep drinking!” says Madeleine. Personally I always forget to drink enough water, but I know how important it is – to fight off viruses, keep me hydrated for the mad exercise classes I’m currently doing on a daily basis and also help digestion. The new BRITA Fill & Go bottles are great for this and perfect for the gym too. I was lucky enough to try out some of Madeleine’s moves from her Winter Wake-up workout, which was a great start to my morning. If you fancy doing some of the moves, below are the key ones which will help you feel fresh and energized for the day ahead. The pose increases breathing capacity as the arms reach up and the muscles between the ribs are stretched. It is also great for impr oving strength in the arms, shoulders and legs. This pose improves our balance and therefore trains the brain and brings awareness to the heart, our primary source of power. This creates 5,000 times the electromagnetic output of the brain, sharpening our mind and focus for the day ahead. This pose is wonderful for the immune system as it opens up the armpits, throat, and groin. It is also very good for the digestion as it stimulates the abdominal organs. The BRITA Fill&Go bottle is an easy way to make sure you’ve always got filtered water on-the-go. It can be filled up at any tap and the filter disk will reduce the levels of impurities and chlorine, leaving you with fresh tasting water wherever you are. It is available in blue, green, grey and pink, RRP £14.99.